G Protein-Coupled Receptors in Immune Response and Regulation, Volume 136 presents emerging concepts related to the role of GPCRs in immune response and regulation. 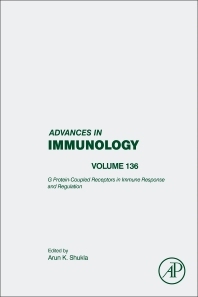 Users will find updated chapters on a variety of topics, including Beta-adrenergic signaling in the onset and progression of asthma, the Emerging roles of Regulators of G protein signaling (RGS) proteins in the immune system, information on Kinin receptors in immune response and pathogenic infections, and sections on GPCR signaling in C. elegans and its implications in immune response, GPCR Kinases in Inflammatory response and signaling, and GRK2 in Inflammation: Regulation of T cell receptors and IgE signaling. Chapters in this book discuss not only the well-known aspects of GPCR signaling in immunology, but also presents many emerging paradigms that have not yet been reported in classical textbooks. Each chapter presents a forward-looking discussion, providing a glimpse of the tremendous potential associated with the specific receptor systems discussed.